(Ground Ivy (Glechoma hederacea) - 01) This beautiful little trumpet-shaped wildflower is only about 1/4 inch across by 1/2 inch long. 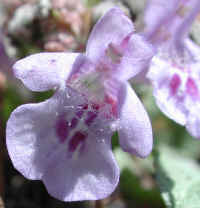 It is a low growing ground cover that rarely reaches over a few inches in height. It blooms in the spring. 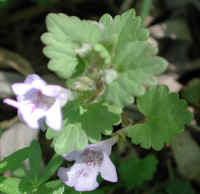 Our thanks to Trevor Kuipers for identifying the ground ivy for us. 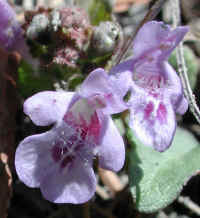 (Ground Ivy (Glechoma hederacea) - 01a) This is a side view of the 1/2 inch long trumpet-shaped ground ivy flower. 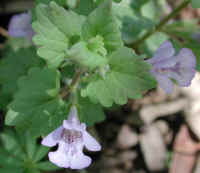 Ground ivy is a member of the Mint family. Some people have classified this beautiful wildflower as an invasive weed. We disagree! It is a cherished gem of God's creation. (Ground Ivy (Glechoma hederacea) - 02) This is a top view of the ground ivy wildflower. This particular plant was growing at the base of one of our weeping willow trees on the shore of Sleepy Hollow Lake. (Ground Ivy (Glechoma hederacea) - 03) This is a semi-side-view of the ground ivy. This beautiful wildflower is found throughout the continental United States with the exception of Arizona, New Mexico, and Nevada. (Ground Ivy (Glechoma hederacea) - 05) The bottom petal of the four petaled ground ivy is bearded in the "throat" of the "trumpet" and on the portion just outside. 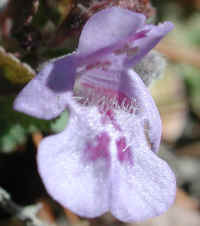 The "beard" appears to extend to the lower portion of the side petals. 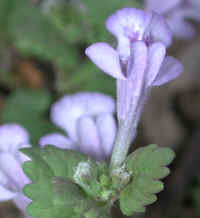 The ground ivy flowers have four stamens and one pistil, but because of their tiny size, they are not easily seen. (Ground Ivy (Glechoma hederacea) - 06) In this bee's eye view of the ground ivy flower, we can more clearly see the four stamens and the one pistil against the upper petal. 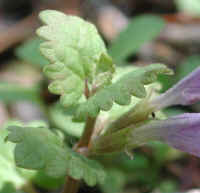 On this ground ivy flower we can also see a few of the "beard-like" hairs on the outer side of the top petal. (Ground Ivy (Glechoma hederacea) - 07) In this 30 times or greater sideways enlargement of the 1/4 inch across ground ivy flower, we can see the stamens growing in pairs, with the pistil behind or above them. 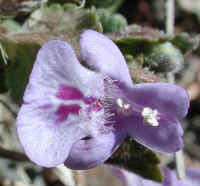 We also noted that this ground ivy flower does not have the hairs on the upper petal (right in photo) as did the previous flower. (Ground Ivy (Glechoma hederacea) - 08) This is another close-up photo of the ground ivy flower. Note the "ribbed" appearance of the "trumpet" portion of the upper petal. (Ground Ivy (Glechoma hederacea) - 09) Ground ivy has a trailing main stem that grows along the ground. It develops roots at the base of every vertical stem. The thick scalloped-edged round leaves grow opposite one another on the vertical stems, and the flowers grow from the leaf axils. (Ground Ivy (Glechoma hederacea) - 10) This is another bee's eye view of one of the tiny ground ivy flowers. We always marvel at the intricate detail designed into the smallest of beautiful creations. 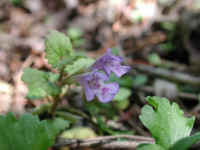 (Ground Ivy (Glechoma hederacea) - 11) In this photo of the ground ivy, we can see the flower growing from the leaf axil. 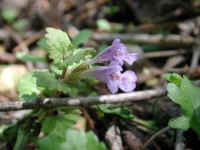 (Ground Ivy (Glechoma hederacea) - 12) This is a ground ivy that was growing in our front yard. They rarely grow more than a few inched in height, and make a beautiful ground cover. (Ground Ivy (Glechoma hederacea) - 12a) In this photo we have a closer look at the leaves of the ground ivy. The leaves grow opposite one another on the stem; they are usually nearly round in outline, or sometimes they are spade shaped on long petioles (leaf stems). The edges of the leaves, or margins, have large rounded teeth with deep leaf veins. If you look closely at the lower leaf edge, you can see very fine hairs. 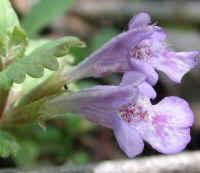 (Ground Ivy (Glechoma hederacea) - 12b) This is a side view close up look at two ground ivy flowers. 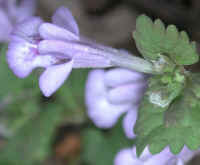 The trumpet shaped flowers grow from the leaf axils and are only 5/16 - 3/8 of an inch long. 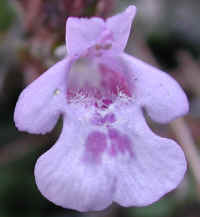 The exterior surface of the flower petals are covered with very small fine hairs. (Ground Ivy (Glechoma hederacea) - 13) This is another view of the ground ivy.